With its caucuses kicking off the presidential race every four years, Iowa holds outsized importance in American politics, hence the swarms of national politicians who descend on the state's rustic diners and county fairs. In a move sure to further fuel more speculation of 2020 presidential aspirations — look, it’s happening in this sentence right here — Gov. Jay Inslee will headline a big Democratic fundraising dinner next month in Iowa. Inslee is scheduled to speak June 23 at the Iowa Democratic Party’s annual Hall of Fame celebration in Altoona, Iowa. He is visiting in his role as chairman of the Democratic Governors Association (DGA), trying to slice away at the party’s record deficit in governorships. In Iowa, Democrats hope to knock off Republican incumbent Gov. Kim Reynolds. With its caucuses kicking off the presidential race every four years, Iowa holds outsized importance in American politics, hence the swarms of national politicians who descend on the state’s rustic diners and county fairs. Three years ago, the event Inslee will be attending attracted the Democratic Party’s top 2016 presidential hopefuls, including Hillary Clinton and Bernie Sanders. It was described by POLITICO that year as Democrats’ first “cattle call” event of the presidential race. So does Inslee’s impending appearance signal he’ll throw his name in the 2020 hat? Spokespersons for Inslee and for the Iowa Democratic Party downplayed that notion, stressing that this year’s dinner is focused on their upcoming gubernatorial race. A six-way Democratic primary will be settled on June 5, so the Inslee-headlined event will serve as a kickoff to the general-election season. Tess Seger, a spokeswoman for the Iowa Democratic Party, said Democrats there admire Inslee’s “incredible progressive leadership in Washington.” She said Iowa has swung hard to the right in recent years, with the Republican-controlled Legislature and Reynolds approving the most restrictive anti-abortion law in the nation, for example. Jamal Raad, a spokesman for Inslee’s DGA work, said the governor was invited to speak at the event by Iowa Democrats. As chair of the DGA, “Governor Inslee is committed to doing all he can to elect more Democratic governors who will drive progress at the state level and be a check against the chaos of the Trump administration,” he said. Raad added that “the real pushback against Trump is happening in the states.” Echoing early statements by Inslee, Raad said gubernatorial races are doubly important because in many states, governors can halt blatant gerrymandering that has favored Republicans. The Washington State Republican Party criticized Inslee’s travels, tweeting Monday that he was “promoting himself 1,726 miles away in Iowa… still missing from Washington State.” The GOP has hit Inslee in recent days for taking no position on Seattle’s controversial “head tax” on larger businesses to raise money for housing and homeless services. 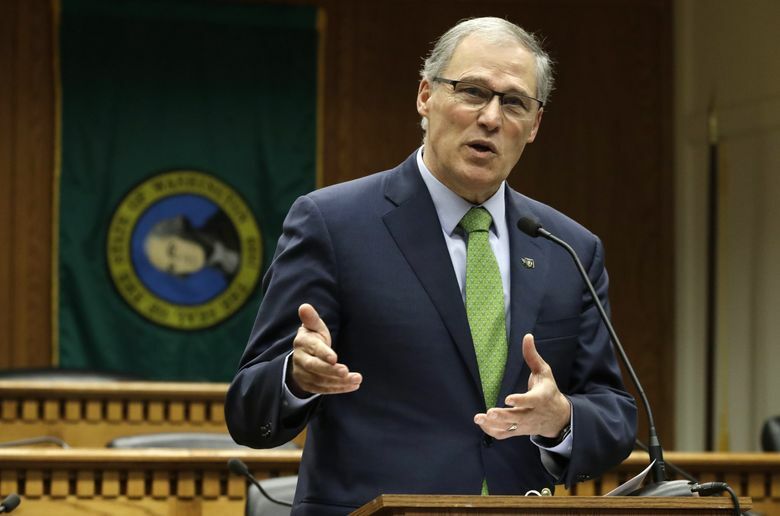 Inslee’s elevated profile and colorful denunciations of President Trump have had some national media regularly mentioning him among the potential 2020 field. His DGA work takes him across the country, including an event in Ohio last fall and a scheduled stop in Colorado next week. Appearing on MSNBC’s “Morning Joe” last week, Inslee was asked whether he is interested.